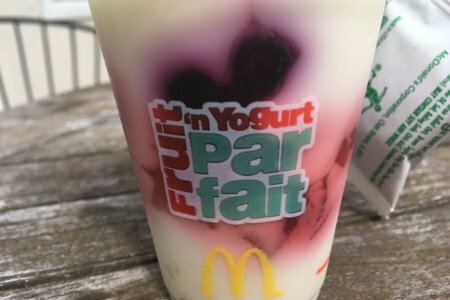 I decided to do a McDonald’s Parfait review because a reader told me that this is what she orders (and I had never had one). I wrote about the egg mcmuffin because it is a relatively healthy choice and I was wondering if this “parfait” might be better. The reason I had never ordered the parfait is that it didn’t make sense to me. A parfait is a dessert consisting of layers of ice cream and fruit. 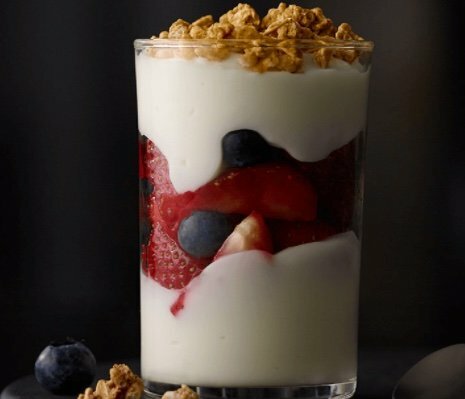 McDonald’s is serving yogurt, fruit, and granola and calling it a parfait. That sounds like breakfast – not dessert. Doesn’t this look like dessert? This is the photo from McD’s website. As you can see, the actual parfait is not as pretty. I went to McDonald's and bought one for a grand total of $1 (can’t beat the price). For your dollar, you get a cup of lowfat vanilla yogurt with berries in it and a little bag of granola. The granola is without nuts and tastes okay. There isn’t that much of it. This parfait was a shock to me because I found it so sweet. I usually eat plain yogurt with some honey or jam added or I eat Siggi’s so it is on the sour end of the yogurt spectrum. Yes! This is a dessert. See that 22 grams of sugar? Compare it to my 10 grams in my Siggi’s and you can see that is a lot more than I am used to. This was really sweet and it did not taste like yogurt to me. I don’t think there are live yogurt cultures in this treat. Overall, as long as you don’t think this is breakfast, I think this is a great choice for dessert when you compare it to the sundaes, smoothies, milkshakes or coffee drinks. Getting out of McDonald’s only having consumed 150 calories (and a little fruit) is a wise choice. If you do want yogurt for breakfast, why not stop buy a supermarket and buy something less sugary? Add an apple to that for the fruit portion. 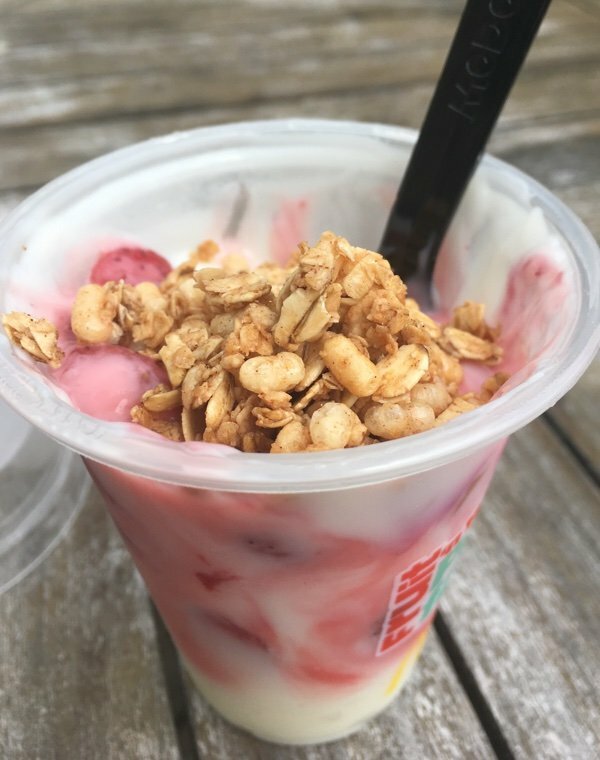 What do you think of McDonald’s Fruit ‘N Yogurt Parfait? Do you like it? Do you eat it for breakfast? Hi! I was just wondering about the sugar in the parfait. I don't usually get parfaits because I don't know what is added sugar and what is natural from the fruit. 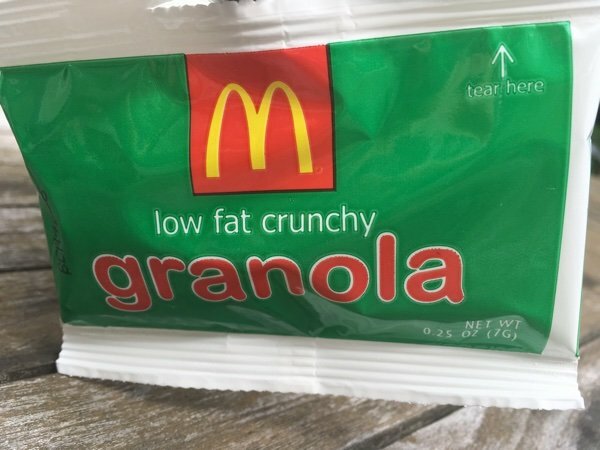 Does McDonald's separate added sugar to natural? I would rather make my own because then I know what exactly is in it. I stopped eating these quite awhile ago (glad I did with that amount of sugar). I make my own version using greek yogurt and fresh berries, sprinkled with a teaspoon of granola. Thanks for the eye opening review Snack Girl! We just had one of these yesterday and in lakeside, ca where we live they make it with chobani yogurt and it was not good for our liking. It tasted like thick sour cream and frozen fruit. We will not order again. I haven't had one, but sugar through the roof! I use Chobani Plain NF yogurt for smoothies, breakfast with oatmeal and fruit, soups, enchiladas - you name it. I love it. My job takes me driving all over my county and sometimes I don't have time to fix a lunch so grabbing this on the go works OK for me. Calories aren't bad and it fills me up. It could be alot worse out there. Plus some of that sugar is fruit. 15 grams is a carb serving for a diabetic so at 30 grams of carbs thats 2 carb servings. Doctor is ok with that. I have been eating these for years and really like them. I don't like plain yogurt or Siggi's as it tastes too sour to me (I have a sweet tooth). I can make this a light meal and be satisfied. I know I could do a lot worse at McDonalds. That's my whole problem with yogurt. If you don't add a whole bunch of sugar, I find it inedible. :) So if I want a sweet treat at McD's, I'll get one of these or an ice cream cone. I think I tried this "parfait" once and wasn't impressed, but I wonder if you've considered the serving size when you're dismissing it for sugar content. It looks like it's bigger than most yogurt cups you'd buy at the store. Some of the carbs are from the dairy in addition to the fruit. I'm sure there's some real sugar added, but I wouldn't be surprised if McDonald's uses artificial sweetener to make it super sweet. There is no artificial sugar that I can see. Remember, McDonald's is a fast food restaurant. We go there when we are on the road traveling and need breakfast. I don't eat red meat, so my husband orders a McMuffin, and I get a yogurt parfait for breakfast. It's hard to find grocery stores along the freeways that are quick on and off. At home, I have unsweetened Greek yogurt and fresh or frozen (unsweetened) fruit and nuts for breakfast, but to do that on the road, we'd need a cooler at the very least. 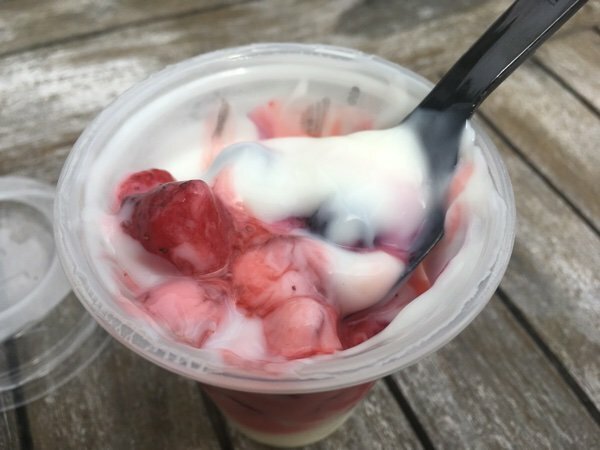 I applaud McDonald's for trying to add some healthier items to their menu, but you can't really expect them to offer unsweetened yogurt, and make it to order with freshly cut fruit for $1. Most people like yogurt that has been sweetened. They sell to the masses. It's not perfect, but it's pretty good considering the source and the price. Actually I like a McDonald's parfait occasionally. However, I had one today and when I finished the cup flipped over and it was 2 days past the expiration date.!!! I love this parfait! I wish they sold them at local grocer so I could buy in bulk to keep in regrig. Garbage. I can't understand why any one can like this, especially with added preservative. Tried it once, could not eat it or will ever again. More McDonalds crap. How much of the 22 grams of sugar is in the fruit? Is the fructose counted as sugar? Yes i would eat for breakfast. That egg mcmuffin has just as many carbs .less than cereal or oatmeal .